Hi Ladies! I hope your all having a fabulous week so far! 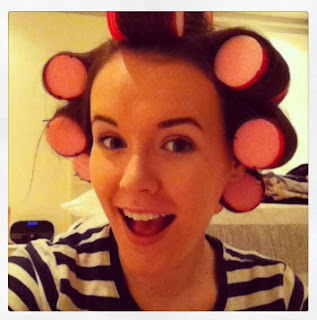 Last night I tried my Sleeprollers for the first time so I thought I'd share my opinions with you all! I'm sure by now everyone knows what Sleeprollers are, mainly because everyone and their dog seems to be tweeting pictures of them wearing the rollers or the results (I'm also guilty of this). But for those of you who don't know, they are velcro rollers which squish down then you push on them, meaning that they flatten down while your sleeping so you can be comfortable while sleeping and still wake up with big bouncy hair! The pack comes with 20 pink sleep rollers, a hair net and a dvd showing you how to use them and tips for getting big hair and a little bit of advertising of their other products. I wanted to test these the way that they suggest that you do so I could get a proper feel for how well they worked, so I sat down to watch the how to video and ended up watching the whole dvd. Its set out like some of the Youtube videos which I love so I couldn't switch it off haha, but I'm sure you wont all be as sad as me! I made my hair slightly damp and rolled the rollers into my hair as instructed. It took me a while at first to get the hang of putting the rollers in and getting them tight as I'm a roller virgin, but I soon got the hang of it and had them all done in no time. I didn't use all 20 so people with thicker or more hair than me will probably find that 20 rollers is plenty because my hair isn't really short. When I first got into bed I found the rollers quite comfortable but I have to admit I did wake up a lot in the night because I found the only comfortable position was sleeping on my back and I don't usually sleep like that, but I guess they are probably a lot more comfortable than ordinary rollers! When I woke up in the morning I waited to take them out until I'd finished doing my make up because I wanted to leave them in as long as possible. To be honest I didn't really expect them to work like I had seen they had for other people on twitter because these things rarely work for me but I was amazed when I took the rollers off to reveal big, bouncy curls! They really worked and the curls have held right up to now which is really great because it's so annoying when your curls fall out! 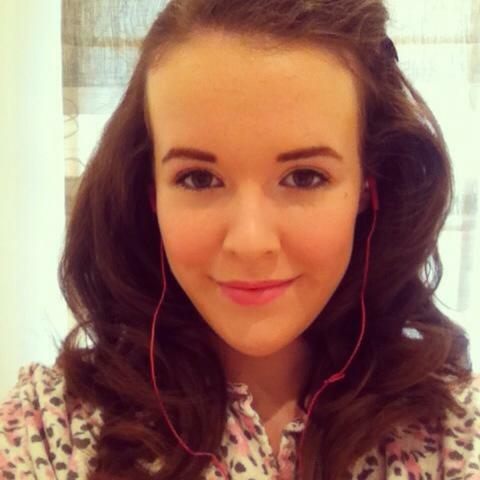 Looking silly with the rollers in! Overall, although they were kind of uncomfortable to sleep in, these rollers are amazing! Your hair will be done in seconds in the morning and the discomfort is definitely worth it for the results! All I used on my hair before using the rollers too was Moroccan Oil so these results were achieved without using any volumising products! Oh my goodness, your hair looks amazing! I love how voluminous it is. I didn't get on with these at all :-( my hair looks great for about 20 minutes then it all dropped out. Tried everything to make the curls stay. Such a shame as for those 20 minutes my hair looked fab! Your hair looks amazing!! You really got the hang of the placement of the rollers!! I tried sleep in rollers after I heard everyone raving about them and I have to say I found them too uncomfortable :/ literally didn't sleep a wink. When I woke I found that my hair hadn't really curled that much either as I guess my hair was a touch too short maybe?? It was big, but not curly!! lol... Never mind... Maybe I'll give them another go now my hair is a bit longer!